Some salespeople have great success with closing techniques. They start closing right at the beginning of the appointment, using a statement like “If I show you how this product will save you 75% over your current product, will you buy today?” and go on from there. These salespeople are successful because they're using social psychology tricks to manipulate the prospect into buying. Other salespeople detest closing techniques, insisting that any salesperson who resorts to the traditional closing "tricks" isn't doing a good job of selling. Sadly, it's rare for a sales process to go so well that you will have no need to close at all. If you build strong trust with the prospect and find a product that's an exceptionally good match for her, she'll be easy to close, but most prospects still won't buy on the spot unless you give them a nudge such as the aforementioned “Sign here” comment. Closing techniques are beneficial in sales because the biggest enemy for any salesperson is inertia. Change is a frightening thing, and if given a choice prospects will stay with their current situation rather than taking a risk by purchasing a new product. So even if you've done your job well and the prospect believes your product is the best option, if you don't make some sort of close he's likely to put off the purchase until he's thought about it further. The bigger (and more expensive) the change, the more likely it is that prospects will drag their feet. Every part of the sales process up to the closing should contribute to the prospect's feeling that buying your product is substantially better than staying with the status quo. 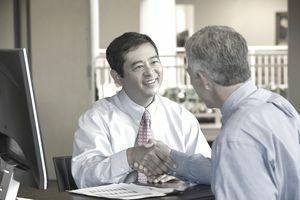 Star salespeople usually rely on very simple closing techniques, such as the presumptive close, because they're careful to lay the appropriate groundwork during the presentation. The complex closing techniques are usually “harder” closes in both senses of the word. They're harder because they're more difficult to deploy correctly, but they're also hard sell methods – they work by pressuring the prospect into a decision he's not willing to make on his own. Most salespeople are best off sticking with simple closes instead of relying on the trickier ones. Of course, some prospects are tougher sells than others. This may be due to an error on your part, or it may be due to factors beyond your control. If your prospect is having a terrible day, for instance, he'll be less willing to listen to you regardless of how well your presentation goes. In these cases, a hard close can rescue a sale that would otherwise be a lost cause. Hard closes are also more likely to annoy the prospect unless done just right since they're more blatantly manipulative than softer closes. But if the prospect is clearly not planning on buying from you, an advanced closing technique can be worth the risk.